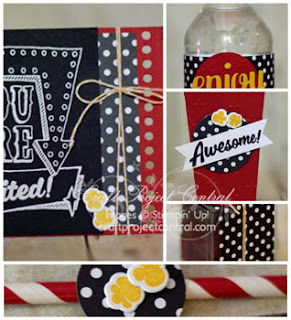 Just Julie B's Stampin' Space: You Are Invited... to Movie Night! Lights, camera, action! It’s movie night…and even the most ordinary movie night will be extraordinary with this super easy project! 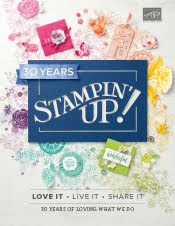 Featuring the Marquee Messages and Ready to Pop Stamp Sets and the Popcorn Box Thinlits this project starts…of course…with an invitation! You can’t have movie night without something sweet and something salty…and this project includes both candy and popcorn boxes. And last…but not least…this project also includes a bottle wrap and a fun, decorated drinking straw. It’s home theater at its best! This super fun project was made by Sue Plote and you can get her tutorial when you subscribe to the month of July over at Craft Project Central.